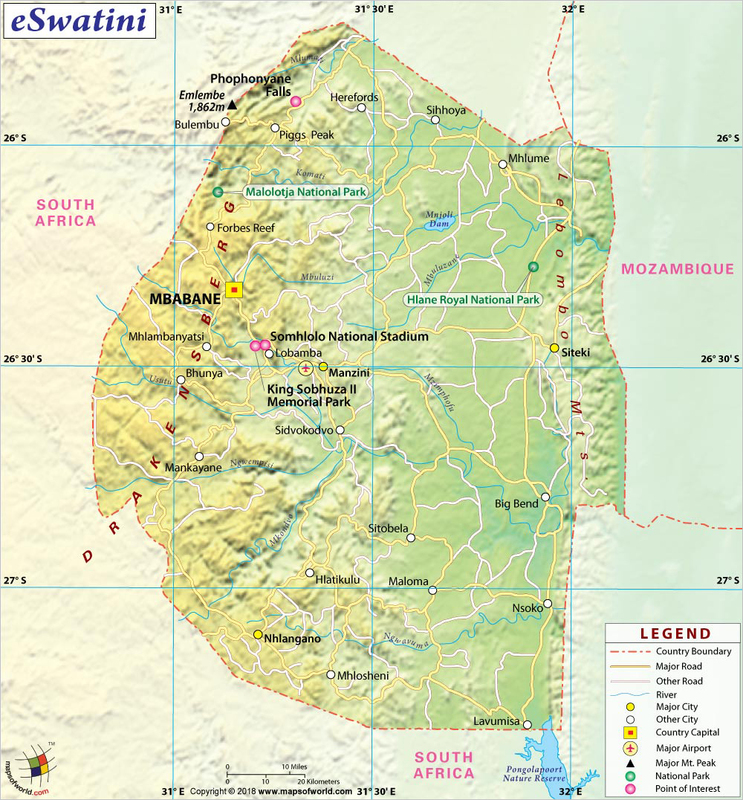 Swaziland, or the Kingdom of eSwatini (Swaziland) as it is also known officially, is placed in southern Africa. It is surrounded by land in all corners and is also addressed as Ngwane. Its other name is Umbuso weSwatini. eSwatini (Swaziland) has a very long human history dating back at least 200,000 years, with the Khosian hunter-gatherers of southern Africa. The Bantu people migrated to the region from Mozambique and settled in what would later become eSwatini (Swaziland), establishing farming communities. Under the leadership of Ngwane III, the Swazi community was established around 1745. The Ngwane Kingdom had territory disputes with the nearby Ndwandwe Kingdom of the Zulu people. The Swazis were forced north due to this conflict, but the successive leaders continued to expand the kingdom's territory, adding new clans and lands. One of the most important of these leaders was Mswati II, who was in power from the 1840s, and made many land conquests until his death. The first European contact with eSwatini (Swaziland) was with the Dutch and British in the 1840s. Dutch South Africa provided protection and assistance to eSwatini (Swaziland). At the end of the 19th century, Swaziland's association with the South African Republic caused it to become involved in the Boer Wars. eSwatini (Swaziland) then became a British protectorate in 1902. They had originally planned to make eSwatini (Swaziland) part of South Africa, but racial tensions made that difficult. Instead, with the help of Britain, eSwatini (Swaziland) moved toward independence, with its first elections in 1964, gaining full independence in 1968. After independence, King Sobhuza took control, and the monarchy has continued after his death. eSwatini (Swaziland) is a landlocked country that shares most of its border with South Africa and towards the east with Mozambique. eSwatini (Swaziland) is a very small country but nonetheless has a varied landscape, with mountains, savannas, and rainforests. The mountains of eSwatini (Swaziland) include the Lubombo range along the eastern border. The highest mountain in eSwatini (Swaziland) is called Emlembe, which stands 1,862 meters (6,109 feet) above sea level. eSwatini (Swaziland) is entirely landlocked, but it does have several important rivers. Major rivers in eSwatini (Swaziland) include the Great Usutu River, Mbuluzi River, and the Ngwavuma. Much of Swaziland's interest lies in its natural and scenic regions, many of which are true rugged wilderness, offering adventure. eSwatini (Swaziland) is home to several major scenic regions, including game reserves and protected parks. One of the best parks in the country is Hlane Royal National Park, which is home to many elephants and rhinos, as well as giraffes and zebras, and lions and leopards. The park is fairly small, but sighting animals, especially rhinos, is very likely. It is also possible to camp out at the park overnight for a more complete experience. Mkhaya Game Reserve is a protected habitat for many endemic and endangered species, including rhinos, elephants, and antelope. Mlawula Nature Reserve is situated within the Lubombo mountain range, and is home to diverse plant and animal life. The park is a great place to explore and hike in the mountain trails. The cities of eSwatini (Swaziland) do not have many attractions other than their markets, some of which sell local handicrafts, including the Swazi candles, and often their nightlife. There are, however, several cultural experiences that can be had in the cities. eSwatini (Swaziland) is home to a colorful culture, which it celebrates with ceremonies and community events. In Lombaba are the traditional royal ceremonies of the Reed Dance (Umhlanga) and the Incwala, which honor the queen and king respectively. Travelers should note that eSwatini (Swaziland) has one of the highest rates of AIDS worldwide, and life expectancy has come down to 32 years (in 2009) as the disease has reached epidemic proportions in the country. Swaziland's international airport is called Matsapha Airport, and is located outside of Manzini. The airport offers service to South Africa and other regional destinations. There are also several bus systems that offer long-distance transportation into eSwatini (Swaziland) from several cities in South Africa and Mozambique's Maputo. Road conditions vary in eSwatini (Swaziland), and driving can be dangerous. Minibus is also the best bet for travel between cities within eSwatini (Swaziland), while taxis are also available most of the time. Minibuses are also a good way to get around the country's parks. The flag of eSwatini (Swaziland) was officially adopted on October 30, 1967. The flag of eSwatini (Swaziland) consists of three horizontal stripes, blue stripe at the top, red in the middle, and again blue in the bottom. Major Religion82.70% of the total population adheres to Christianity, making it the most common religion in Swaziland. Anglican, Protestant and indigenous African churches, including African Zionist, constitute the majority of the Christianitys (40%), followed by Roman Catholicism at 20% of the population.